"A very yummy and healthy meal that tastes like it should be bad for you. I use hot chili seasoning. Enjoy." Heat oil in a skillet over medium heat. Cook and stir onion and garlic in hot oil until soft and translucent, 5 to 10 minutes. Heat a large pot over medium-high heat. Cook and stir turkey and chili seasoning in hot pot until turkey is browned and crumbly, 5 to 10 minutes. Stir onion-garlic mixture into turkey mixture. Add chili beans, corn, black beans, water, diced tomatoes, and tomato paste; stir. Bring to a simmer, reduce heat to low, and simmer until flavors blend, 1 hour. Not bad, but pretty wimpy since it relies on a chili spice mix pack for its seasoning. I had to add more chili powder to get more taste. Great simple recipe that's even better as leftovers. I used Mrs Dash chili seasoning and a can of Rotel for the tomatoes. Thanks for sharing a quick, inexpensive hearty meal. I added some jalapenos to make it a bit spicy and a little sugar. 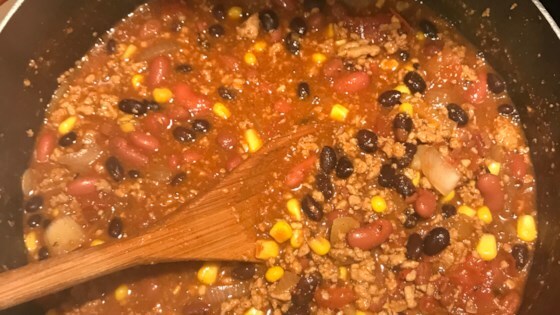 Very good chili! Tastes awesome! I didn't have chili beans so I just uses kidney beans. was Delicious!